This interview took place on: 8/8/12. JFH (John DiBiase): Would you say the album title Resuscitate also fits the rebirth of Remedy Drive as a band? David Zach: Yeah. I didn't think of it that way when I first wrote the song. Honestly, I wrote the song on November 5th ; it was the first time that lyric entered my mind. And the first take of the song was a ballad: real haunting, sad, desperate, quiet, pleading. It was the night that my brothers finalized leaving the band. So, to have that song be on the record is really important to me. To have it be the title track is even more so important to me, because I needed a rebirth. I needed to be brought back to life, personally. At the same time, the band needed a rebirth; it needed a second chance. It needed a new start. JFH (John): So how did it go from being a ballad to a rock song? David: Just that rhyme, "It's not too late to resuscitate" -- I remember sitting at my kitchen table when I thought of it. I was just writing. And from then on out, I just knew I wanted it to be sort of a chant there. And at the time, some of the music that I'd listened to a lot was some heavier stuff than I usually listen to. JFH (John): Really? Like what? David: Well, without giving the influence away too much, Hello Hurricane was a huge influence on my life at that point. Not that that's hard music or not, but it's more riff-driven rock n' roll. JFH (John): Can you talk about the song "God I Hope So?" Was it kind of a hard song to write? David: Yeah, I wrote that one with a guy who I've written a lot with, Jason Walker. [He's] a good friend of [my brothers] Paul and Phil, too. He played at Phil's wedding. I wrote it shortly after [my brothers left]; I hadn't talked to Paul in about a month or so. Cuz we live in different cities now, and that was really abnormal for me. And talking to him and just kind of shootin' the breeze, after getting off the phone with Paul, I was so overwhelmed with emotion. Cuz this is the first time I hadn't talked to my kid brother for that long, y'know? And just kind of catching up... We were always solving things, we were always working side-by-side, putting melodies together, putting tours together... and now it was just, "So... how you doin'? "-type thing. And that's normal for most people, but for me, I was so against it. And I was so bummed out by it that when I got off the phone with him, the guy that was driving me to this songwriting session had to pull over. And I just wept. And when I saw Jason--it was the first time I'd written with Jason, he didn't know about changes in the group--it was the only time I'd ever cried with someone and wrote a song at the same time. It just poured out of me. It just poured out of me in a sense that: I know that there's chapters, I know that there's regrets, I know that there are doors that close, but I just don't understand them. And at the time, there was just barely enough hope in that song. "God, I hope so," that's all I could barely hope for. It's turned out to be my favorite song on the whole record. David: Yeah. That's the piano bench that creaks in the first verse. Listen for it! JFH (John): I really like that song, too. I can relate to the emotion of it, and I think it'll really resonate with people. Was the writing of it kind of freeing for you? Did it help bring some closure for you? David: I honestly think it did. And even more so, I sang (recorded) the vocals on my brother Dan's birthday. *laughs* So there was a lot of closure in that, and being able to accept that this is how it is. And being able to turn the page and embrace the new chapter with the new guys, and being able to be excited about it. Because, at first, I was so excited about the new things that were happening, but I was so bummed to go on and do things without these guys that I love so much that I'd been doing with for so long. Being able to get rid of that baggage and come to grips with 'this is just the way it is.' And maybe we'll look back someday and be thankful for it. JFH (John): Have your brothers heard that song? JFH (John): What are they up to these days? David: Dan sells Lexuses. Phil produces music and has his own side project called Arrows & Sound. Paul is involved with music and doing music at a church. But it's nice for them; they're all local. They're all still in Nebraska. They're not away from their families. JFH (John): Did the studio experience feel vastly different? And who did you work with? David: Pete Kipley was just fantastic. He was like a kid in a candy shop. And the relationship between Pete and our drummer Timmy Jones was just fantastic. Seeing the way they played off each other, the energy that Tim brought--Pete is great but he gets worn out--what Timmy did is he energized him. Pete soars off of creative joys and when the juices are flowing, man, he's just doing great. And then we'll hit a brick wall sometimes, and what Timmy did is he kept on putting wind in Pete over and over. Pete was such a coach; he was such a friend and a mentor throughout the process. JFH (John): How much did the new guys - Timmy, Corey, and Dave - contribute to the recording process. I mean, as far as the studio experience goes as opposed to when your brothers were in the band. Because, I'm sure after a while, you and your brothers had more of a natural process of making music together. So how was it with the new guys? David: Honestly, I really leaned into the fact that it's different than having four guys with the exact same musical background. [Now] we have four guys who have four completely different musical backgrounds, not just in terms of influences and stuff we all listen to, but in terms of experiences the other three guys have had in different groups and different arrangements and in different states and cities. We've got Florida, Memphis and Chicago -- two of which are fantastic music cities represented. So, a lot of the time, I was an observer and a strong opinion. Knowing our joke is that rhythm and pitch are not my forte, anytime there was a piano part being written or worked on that wasn't done yet, it was really me, Pete and Timmy all kind of working it out together; we'd all be playing stuff. At the end of the day, though, I had preferred that Timmy be the one that tracked it. Cuz being the drummer, he's so much better with rhythm. And we didn't use any MIDI; it was all real piano. There's MIDI on the synth, but it's all real piano. Sometimes the parts are mixed back and forth; Dave played almost all the guitar. And honestly, if I was playing a part, I really like coming up with a part whether it's singing a part or singing where I think it should go--I did a ton of that--and not having the instrument in my hand helped me be more creative on just hearing what I think it should sound like than singing it. JFH (John): Did you collaborate with anyone on song writing? David: Most of the songs we picked, happened in 2011, which was when we were starting to get to know each other. I worked on songs with a lot of guys I had relationships with in the past. Allen Salmon had two cuts. He wrote "Crystal Sea" and "Make It Bright" with me. JFH (John): Was there anything you accomplished with this record that you wanted to that you haven't accomplished before while making a record? David: I've always said, "Next time we put something out, it has to make me cry. Otherwise, it's not going to make other people cry." *laughs* In that sense, I've really accomplished that. The song "Resuscitate" is like none we've ever had before. And the energy it has live is so special and so necessary for our show. So I've always wanted a song with that feel. That's great, and the other thing is having really accessible songs that work with the audiences. That was a goal of mine and I think we definitely nailed it. JFH (John): The album is very hopeful and focuses a lot on brokenness and encouragement -- like "Lost Cause" and "Don't Forget" -- what inspired this kind of theme that is threaded throughout the whole record? David: When I stumbled on that lyric, "I might be lost, but I'm not a lost cause," and ended up using it twice, I realized that not just for me but for most of us, we have this age old ache, this longing to be reunited with this infiniteness that we've lost. There's a sense of being banished; there's a sense of knowing that we're intended for this greatness and we've fallen so short. And instead of getting bummed out by it, I'm at a hopeful place in life where I'm obsessed with the beauty and the mystery that is redemption. Obsessed with the idea that we were born remembering this song. We were born to be princes and princesses of a different realm. And the enemy holds us at bay, blinds us to the truth of who we are. And why I believe in this album, and why I believe in art so much, is that a song, an album, a beautiful painting can remind us for an instant--not of everything--but remind us that we've forgotten. Because we need to remember that we forgot and, in doing so, press on to the mark of the high calling. JFH (John): Yeah, that's what I like so much about "Don't Forget." Because it almost seems simple and obvious? But it's something that we constantly forget: who we are in Christ. It's easy to get bogged down with life and disappointments and just forget that. It can be the furthest thing from your mind. So I really like how that song is kind of an anthem for that. David: And for me, it's in my head, but more so it's in my heart. And sometimes I can't describe what it is that's in my heart. And when I saw Rapunzel locked in a tower, taken captive by the enemy, she knew that she belonged to this kingdom and she knew that when those lights went off every year, once a year, she knew there was something special about the lights that connected her to that distant kingdom. And it turns out at the end that she's a princess and the enemy didn't want her to know the truth--that she belonged to this distant kingdom. In the same way she looked at those lights, when I consider the heavens, the works of Your fingertips, who am I that You're mindful of me? "Who am I?" David says, the Psalmist. And "Who am I?" I say. We need to continue to ask that question and stand amazed and standing in awe under the stars. JFH (John): I like that analogy of Rapunzel. That's awesome. David: Dude, that flick was God-haunted from my perspective. It was just such an obvious parallel. JFH (John): I'll have to rewatch [Tangled] with that viewpoint. David: Yeah. Why do we cheer up at such an obvious fairytale? I think it's just a shadow of our story, which is so much more beautiful and so much more real. Having baby girls has reminded me how similar our story is to these fairytales; the difference being our story is true. JFH (John): When putting the songs together that would make up the album Resuscitate, what made you bring over the song "Hold On" from the Light Makes A Way EP? David: I love the song and the record label loved the song. For my wife and I, it's a special song because that EP was being recorded and released in the midst of a member change, a record label change, selling our house, moving from Nebraska to Nashville, having a newborn daughter... *laughs* so it came in the midst of the least comfortable time of our lives. Very chaotic. Everything was changing. For her, "You give me something real to hold on to," y'know, it's kind of our song together, too, between the two of us we can sing it to each other. And we can sing it to the King of the Universe. JFH (John): Were there any other songs you considered porting over from the EP to this record? David: I love "Follow Me." That one will be on a record some day soon. JFH (John): Can you talk about the song "Crystal Sea?" I really like the imagery in that song. David: That was one that we as a band, we all unanimously loved even before we had lyrics. Just the way the guitar is, the guitar part and the "Oh's". But in the same sense, that lyric was written in the same time period I was talking about when there was nothing firm beneath my feet. There's no sure foundation. And it's tumultuous. There's earthquakes in the middle of my ocean. And the waters are rising up to the end of my soul. Knowing that it's temporary is so important. Knowing that the storm is temporary. Knowing that the fire, knowing that the continents colliding -- that's just something that happens for a time. But someday, these songs and these fractured relationships, these broken hearts of ours, will still have these songs to sing by a sea of glass, I hear. That's what I read. And we'll stand by a sea that's not tumultuous, but it's going to be crystal. And that hope for me is something I need. I need to know that whatever I'm going through, we can hold steady. We can hold through it because the melodies are gonna last. And I want to keep on singing these melodies cuz we'll sing them together by the crystal sea someday. JFH (John): How did you guys get linked up with Centricity Music for this record? David: An agent of ours at the time, Chris Blaney, introduced us to their A&R guy. He was a fan of "Hold On," especially. They didn't know we were still a band, to be honest. JFH (John): Can you talk about the album cover artwork? David: That is - what do you think it is? JFH (John): What do I think it is?? David: Part of me doesn't want to give away what it is, but I will. David: It's a smashed windshield. JFH (John): Oh, nice! I like that you revealed what it is, why wouldn't you want people to know? JFH (John): Any major tour plans? David: We're doing our own dates this fall. No news for the spring yet. 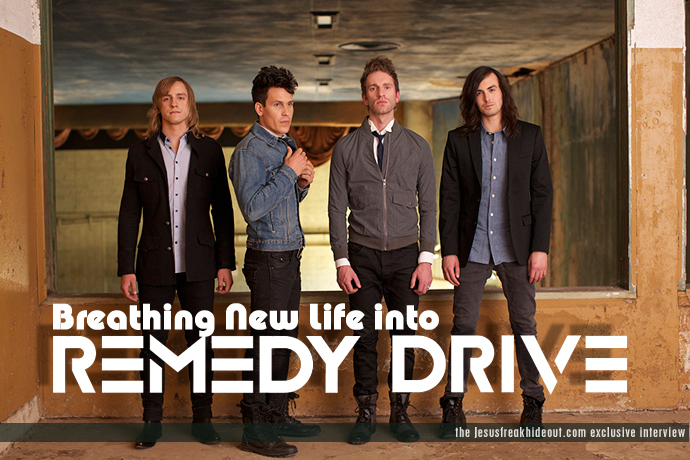 Remedy Drive's Resuscitate releases everywhere September 18, 2012.